Here I go again: up to Boston for another Diva. 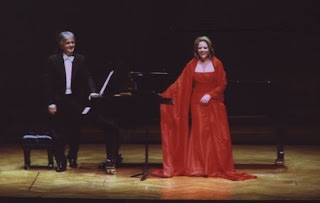 This time it's La Diva Renée with Hartmut Höll at the piano. This is going to be an experience not to miss from the program that Renee has chosen to perform. My favorite selections would have to be the Erich Korngold compositions. I wonder how "Ich soll..." with its rich orchestral score will sound played on the piano by the incomparable Hartmut Holl compared to the recording of it on her "Homage" CD?